There were simply tons of people up for this ride today. The fast boys had themselves organised in pretty quick time and they went off err… fast. 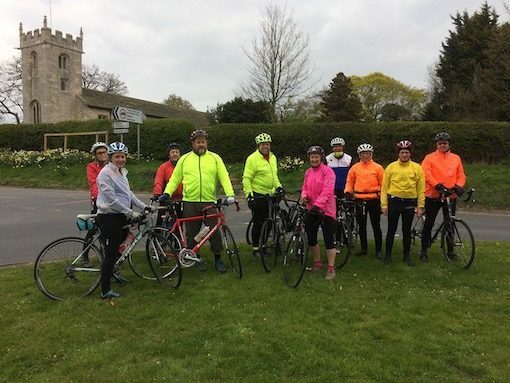 There were still too many left for one group and thanks to a very kind offer from PCJ, two groups formed and I led off what we tried to make the slower of the two. This did not work out too well and some of my team were champing at the bit to get on with job, and so we managed the overtaking manoeuvre at the level crossing in Starbeck (which was closed to us), and so utilising the underpass we found ourselves released and to the fore. 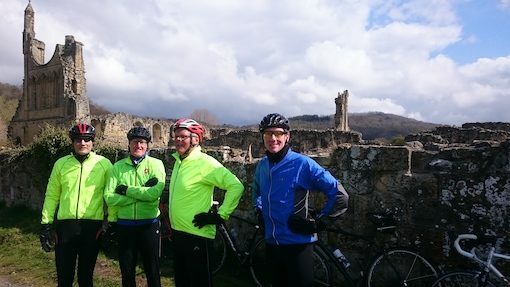 Good progress was made into a bitingly cold Easterly, with only comfort breaks as punctuation. 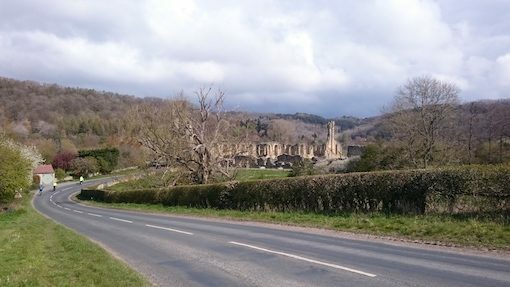 Ampleforth was gained in just over two hours and the ascent of Yearsley Bank commenced, whereupon without getting to the nitty gritty of the climb, my chain snapped. 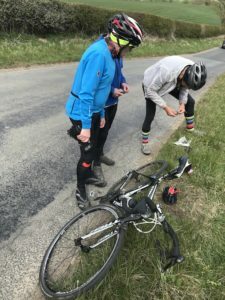 It flew through the air and landed forlornly in the road; one of our group said they thought it was someone’s bootlace which had flown out! Luckily, sufficient equipment and expertise was discovered within the group, and the chain was duly shortened by a couple of links, allowing us on our way after a stop of ony about fifteen minutes. Easingwold was gained after the hairraising descent, only for us to discover that some kind of Vespa Scooter Rally was in progress. The place was packed with people and the prospect of a seat in a cafe looked grim. However, a bit of gentle persuasion at the Curious Table found room for us and lunch was procured. The fast boys were just leaving and pleasantries were exchanged, and before long we too were on the road again, hoping to enjoy the promised tail wind. It never works like that though, does it? Good time was made on the return, nonetheless, and were were back in Harrogate for around 3-30. 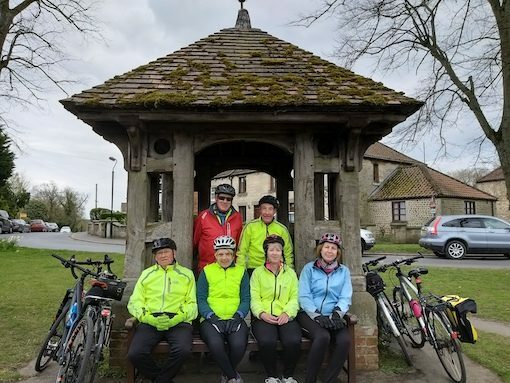 Thanks to Janet, Julie, Helen, Denis, Dave W, Pete, Mike, Marvin and Geoff for your great company and for a most enjoyable ride. DaveS. Eleven of us set off on the medium plus route flagged as the Solar Ride. Well there was very little sun and whichever planet was in charge today was rubbish because it was freezing cold! Dave, Brian and Charlie left us at Tadcaster for an earlier coffee stop. 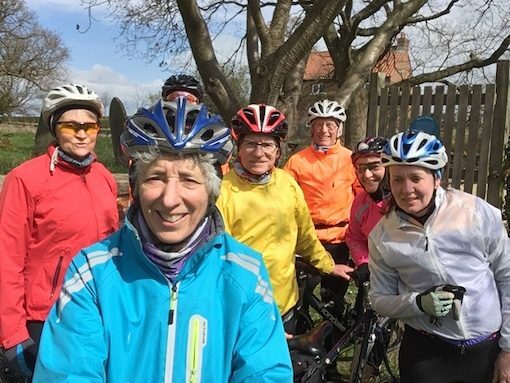 The rest of us battled with an annoyingly persistent wind all the way to Bolton Percy. 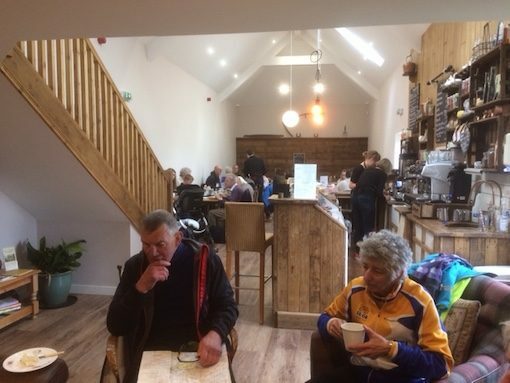 There our mood changed considerably with a wonderfully warm welcome at the newly renovated cafe. A standalone building with a mezzanine floor, lots of space and for the warmer days a spacious courtyard. So Doyly’s Cafe is a must for any cyclists out in that direction, great service, warm welcome and good food. They are open Wednesday to Sunday. 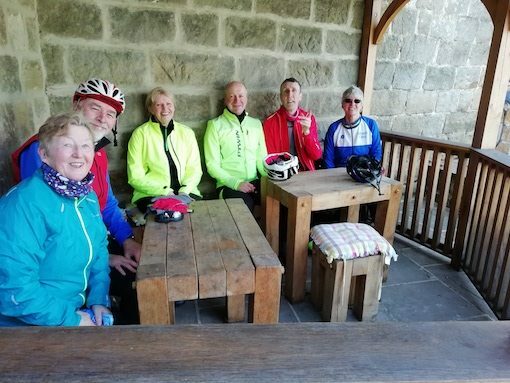 We all agreed that there was no need to head any further in to the wind just to “do the Solar path” so we took the route over the railway line at Colton Bridge and directly to Bilbrough and Askham Richard. Having the wind behind us was a blessing and for a while we had some sunshine. We stopped to look at the site of the old oak tree in Cowthorpe before our final route home via Little Ribston. 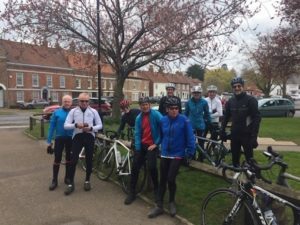 The medium plus fast group decided to do the long ride route as there was only a short difference in length on paper, a lumpy route profile and an energy sapping chilly headwind spiced things up however. 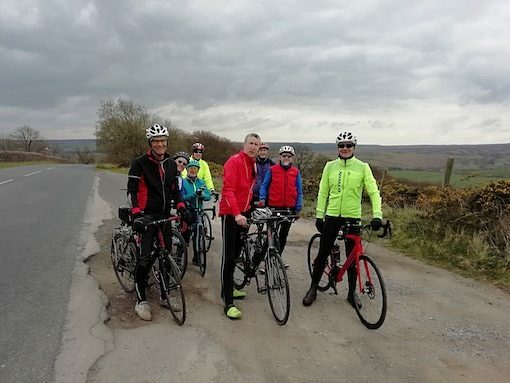 A high-ish pace was set in the opening hour on the flat by a group of seven and we reached Ampleforth in good time, the relentless grind up Yearsley Bank and the long stretch between Crayke and the café at Easingwold thought the writer to eat more on rides of 4 plus hours in duration. The pace was more sedate on the stretch home and we still managed to get those interested in watching the last hour of Paris Roubaix in front of the TV in time. Darcy.